FB Purity v23.1.0 has been released, it hides the new “Suggested For You” box and lets you filter stories in the Trending Box with the FBP Text Filter. Happy New Year, FBP Fans! I hope your new year is going well and I hope you are enjoying using FB Purity to keep your Facebook clean and tidy. Maintaining and Updating FB Purity is a lot of work, so if you have been using FBP for a while, and can afford it, donations are always welcome, heaps of gratitude to those who have donated to the cause already, Cheers! Fixed the “Hide Sponsored Box / Posts” option to hide the new “Suggested For You” box (which is a box containing a list of videos Facebook thinks you should watch, located to right of the Newsfeed). This option is turned on by default when you first install FB Purity, so just installing or updating FBP should be enough to remove the “Suggested For You” box. Fixed the “Sort Notifications Chronologically” option. **Update** it seems there’s still a minor bug in this option, but it shouldn’t happen too often, where sometimes the notifications list may go blank if you are receiving lots of notifications at a rapid pace. If this happens just close the list and re-open it and it should show up again. Alternatively, if its causing problems you could turn this option off for now, and just click the “See All” link at the bottom of the notifications list, as that will show your notifications sorted chronologically too. New option titled “Apply ‘Text Filter’ to Trending Box”, located on the Trending Box options screen, which can be accessed by clicking the cogwheel icon at the top left of the “Trending Box”. With this option ticked, FBP will filter out any stories containing any text you have entered into FBP’s “Text Filter” box. FB Purity is now available as an official Microsoft Edge extension available directly from the Microsoft Edge store So the old method of installing the FBP GM Script via the Tampermonkey extension is no longer required. If you install the official Edge FBP extension from the Microsoft Edge store, it should auto-update when new versions are released in future. Be aware however that the Microsoft Store has a slow (manual) approval process for accepting extension updates, so the new version will not show up in the Microsoft Store for a day or two after I release an extension update. For those who don’t already know, FB Purity is a safe, free and top rated web browser extension for Google Chrome, Firefox, Edge, Safari and Opera . It lets you clean up the junk and customize Facebook the way you want it to be. It has many cool features, such as hiding all the ads, alerting you when friends un-friend you, letting you change the site’s colours, fonts and background image, it lets you stay on the “Most Recent” feed permanently and lots more. 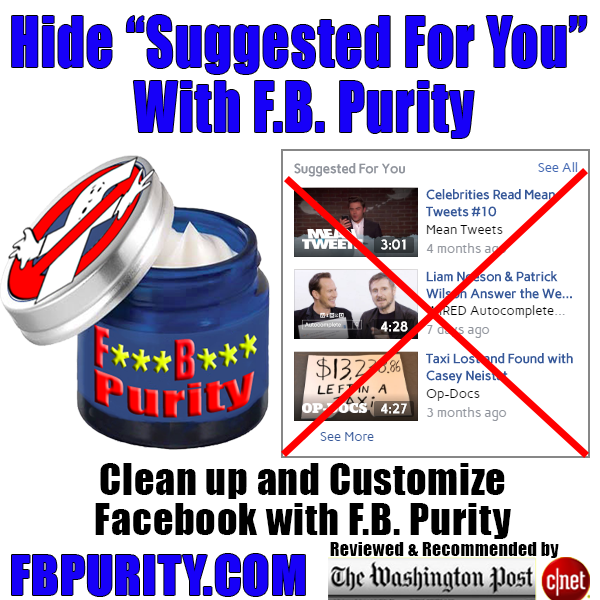 FB Purity has been reviewed and highly recommended in many places including the Washington Post, CNET, PCWorld, MacWorld, GetConnected etc and has over 409,000 users worldwide. F.B Purity Update v7.5.1 – Fixes the ‘Hide Trending Articles’ Option, Hide sponsored box option also now hides sponsored stories in the newsfeed. This entry was posted in Facebook, FB Purity and tagged clean up facebook, customise facebook, Customize Facebook, Facebook, facebook purity, FB, FB Purity, FBP, filter trending box, filter trending stories, fluff busting purity, Hide emoticons, hide facebooks suggested for you box, Hide Smileys, hide the suggested for you box, how to hide suggested for you, suggested for you. Bookmark the permalink. I love your software. Unfortunately, I live on SSDI and although I would love to donate, I cannot because of my limited income. BTW, Facebook has come up with a fairly new “tactic”! They are NOW inserting ad’s in the middle of articles. Not just one, but sometimes several – so you have to scroll past ad’s to continue to read articles! thats interesting, can you link to an example, i have not seen anything like that yet. i have seen the ads embedded in videos, just not articles yet.